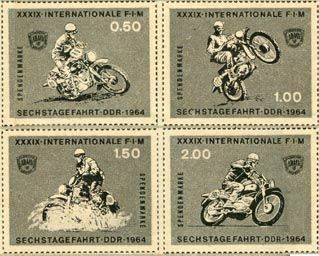 Our thanks to “STB” efforts plus kindness of Marc Petrier who allowed us to use his copyrighted matter used by FIM. 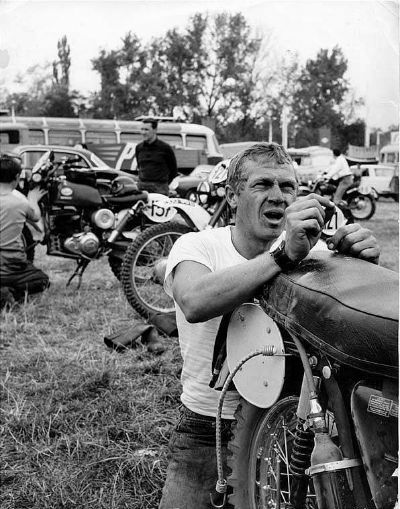 “Hollywood Hero, Motorcycle Fan Steve McQueen is world-famous as a top movie actor of the 60s and 70s. 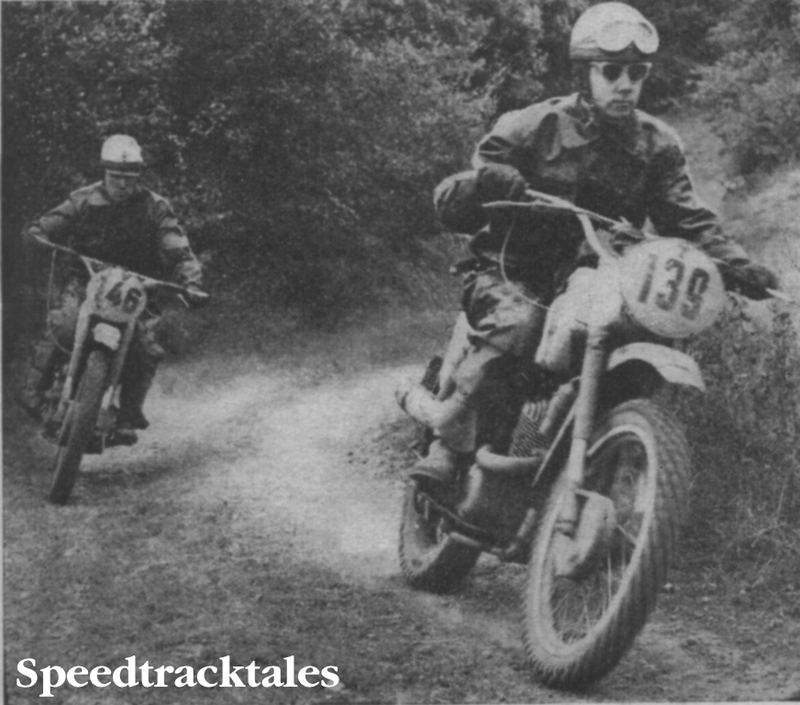 He started as a mechanic in the US army and he kept the taste for speed all his life. After a couple of movies in the 50s, his reputation began to grow with the TV series “Wanted: Dead or Alive” which started in 1960. After major roles in some well-known movies he was then offered a top role in John Sturgess’ “The Great Escape” in 1963. 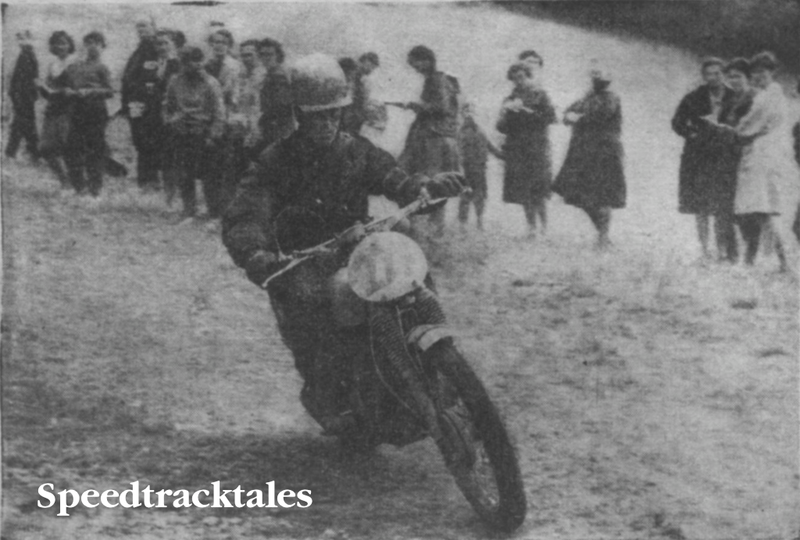 A long-time fan of motorcycle and car racing, Steve himself suggested the motorcycle jump over the border fence at the end of the story. 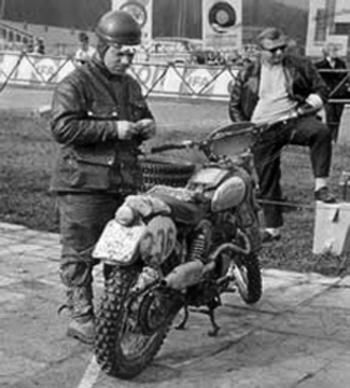 Steve McQueen had brought along his friend Bud Ekins, a keen motorcyclist, who was hired as stuntman. 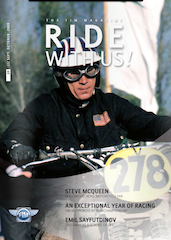 Steve rode in almost all the riding scenes except the famous jump at the end. 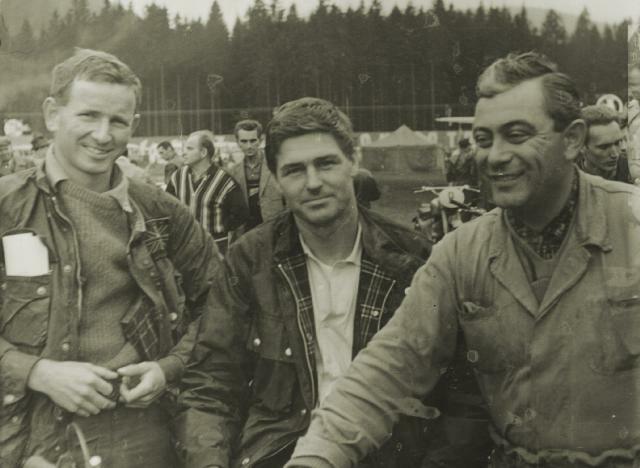 During the making of the movie, Bud Ekins went to Czechoslovakia to take part in the Six Days in Spindleruv Mlyn, where he clinched a gold medal. Back with Steve he spoke about it and the idea came up to prepare a US team in order to participate in this event the year after. 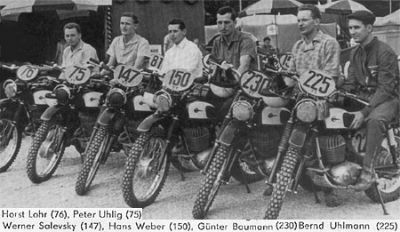 The following riders were entered for the ISDT in Erfurt, East Germany, from 7 to 12 September 1964: Steve McQueen (Triumph TR6 750), Cliff Coleman (Triumph TR6 750), Bud Ekins and his brother Dave (both on Triumph TR5 500), all four forming a Vase team; there were also J.A Taylor (175cc Bultaco), W. Stewart (175cc CZ), P. Hunt (250cc CZ), St. Peters (250cc Jawa), J. Smith (250cc CZ), and J.F. 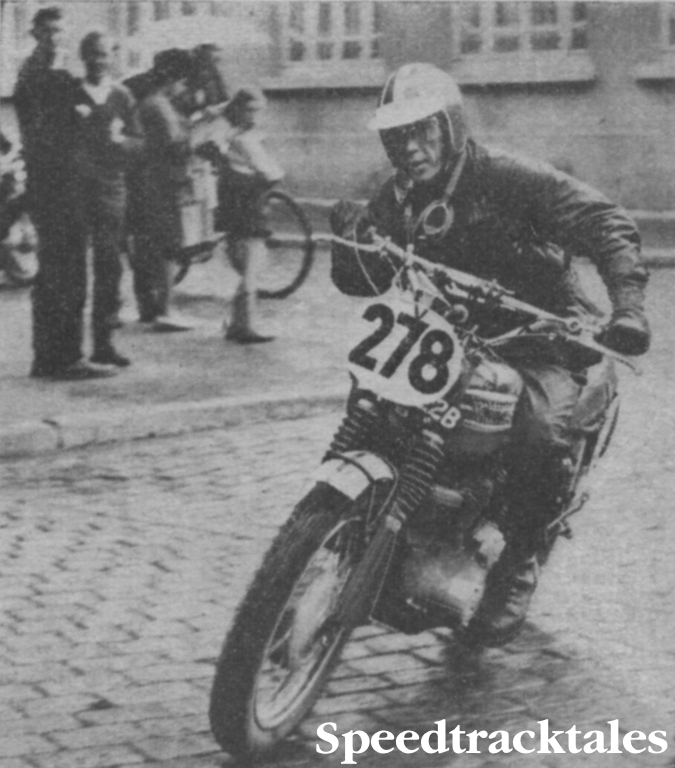 Steen (Triumph TR5 500cc) who was the reserve rider for the Vase team. 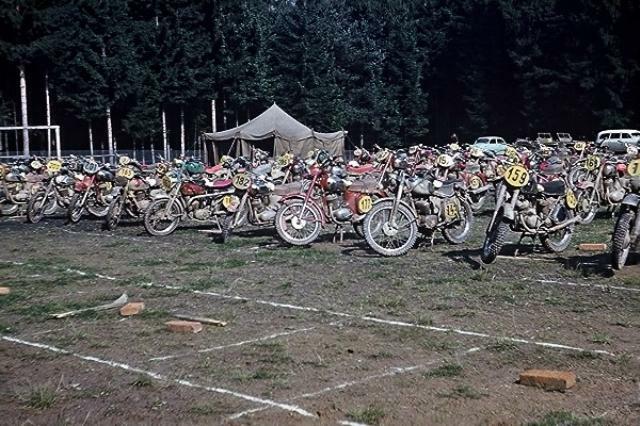 The problem was that most of them were much more used to desert racing than the heavy and muddy soil of central Europe. However, on the first day of competition in Erfurt, and despite the rain, the US riders finished within the time schedule and the team was leading the classification. On day two, with the same conditions, everything also went well and the team stayed ahead for the Vase contest. On day three, the sun was shining and the riding conditions were good. But suddenly things went wrong: Bud Ekins hit a little wall with his left leg, but finished in time. 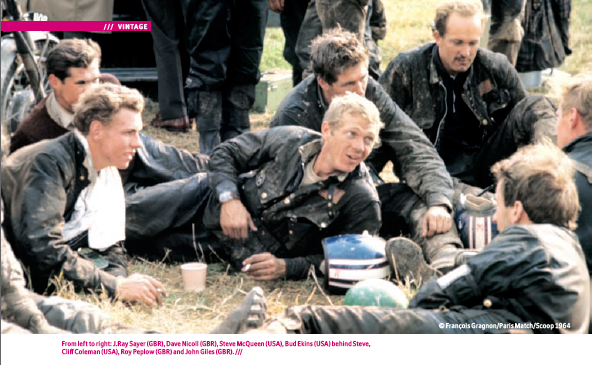 Steve McQueen had a first crash, resulting in a mechanical problem which he was able to fix rapidly. Riding fast when trying to avoid losing too much time, he suddenly had to avoid another rider and he flew off the track, crashing heavily. 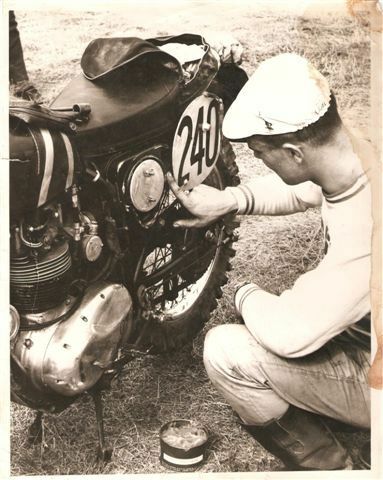 He was not seriously injured but his Triumph was too much damaged (the front fork was bent towards the frame), and he had to retire. 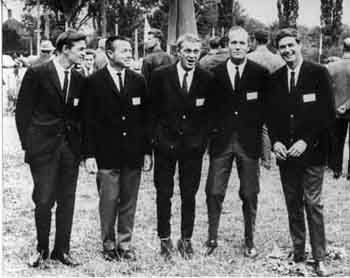 As the team’s contest for the Vase was now beyond reach, Bud refrained from starting the next morning – his left ankle was broken. Cliff Coleman and Dave Ekins continued to ride for an individual Gold Medal, which they both clinched. 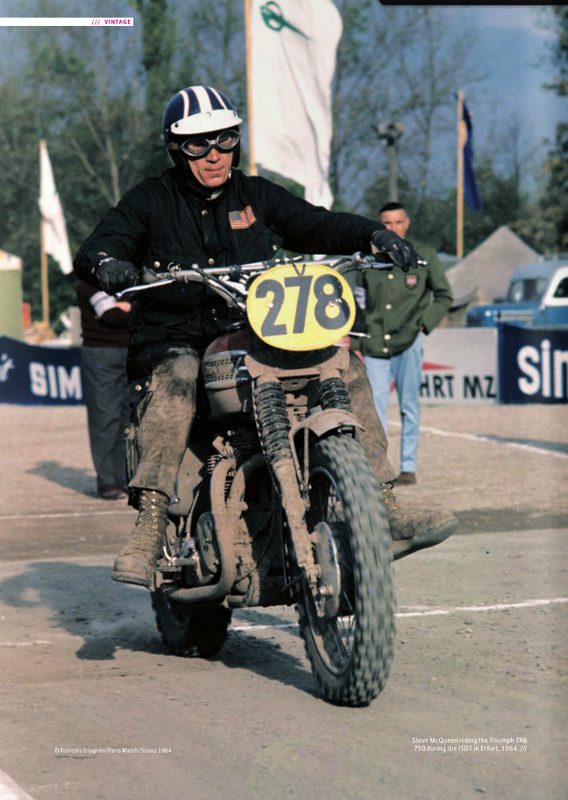 More stories remain un harvested out there about Steve McQueen’s time in the ISDT. 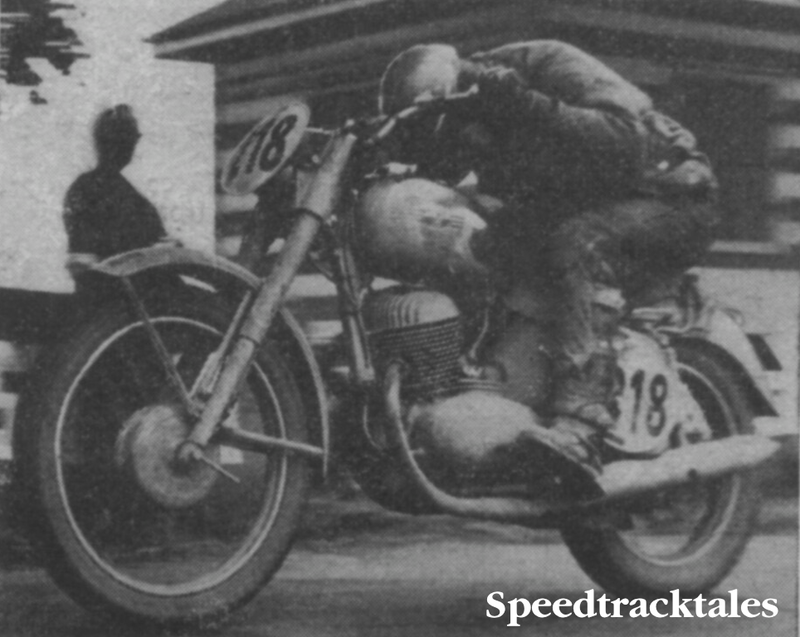 Many of the best images have been assembled on a Speedtracktales Blog. 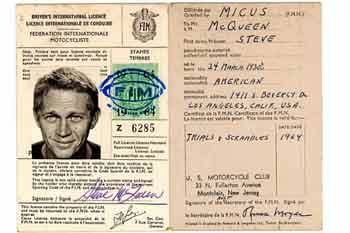 Sadly I’ve heard a few unflattering yarns, ones which suggest McQueen purchased his way onto the US Team by funding it. 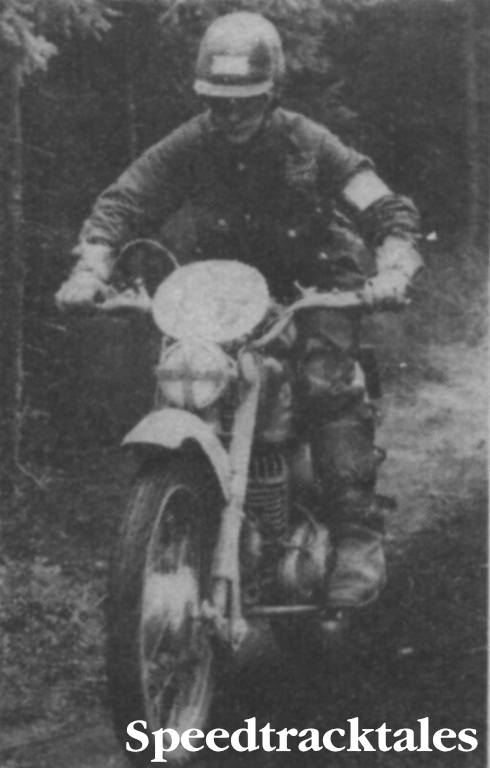 This may have some truth, it is clear from Dave Nicholls observations in the FIM magazine that he might have been fast in the woods but was not fast enough when speed really mattered, but I have never doubted that his enthusiasm for the sport was maximum and if he could afford it, why not! his riding was certainly up to the standard required for riding in the event. Photo from down under, #237 Tim Gibbes with another star from far away, #240 Bud Ekins who has so sadly recently left us, great people & riders both I think 1964. 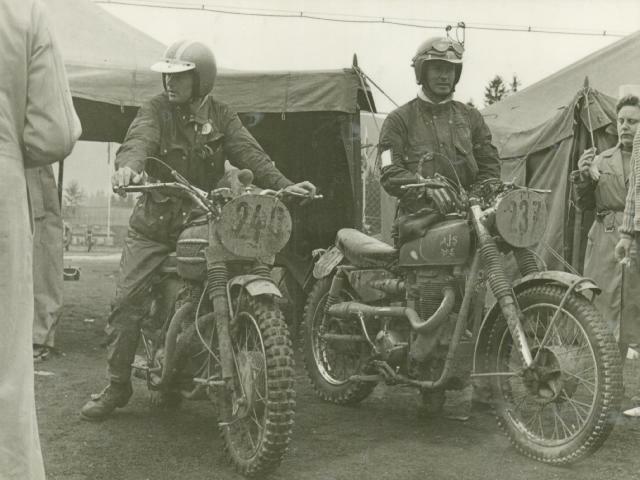 In the above picture from the Tim Gibbes website is Stan Cerney who was an extremely devoted & friendly Czechoslovakian who worked for Motokov, the marketing arm of Jawa & CZ motorcycles at that time and helped the overseas riders on Jawa machines. 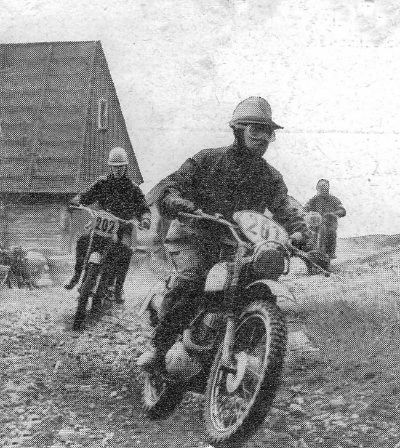 For a insider view of the USA Vase team in the 1964 ISDT check the story of ‘Canal Road and the ISDT‘ on the website of Bud and Dave Ekins which covers from their arrival in London, collecting the bikes from the factory and the road trip to East Germany. Triss with his brother Bryan really were highly spectacular & efficient. thanks for the pic Pat. Contents placed online by courtesy of Arthur Williams. 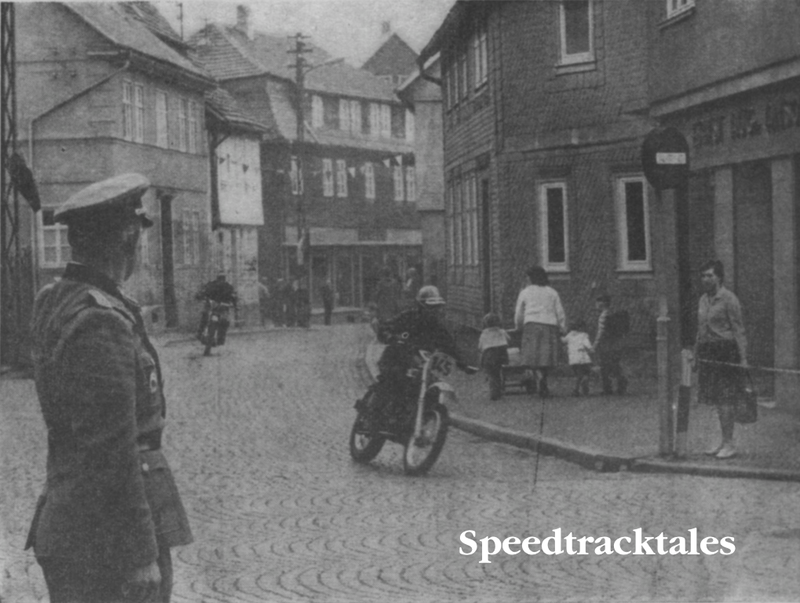 Start & Finish was on edges of the town & HQ was inside Erfurt itself. 3 courses loopsout into the countryside led south to near Arnstadt, using all 3 in differnt directions the 6 Days had it’s tasking course. 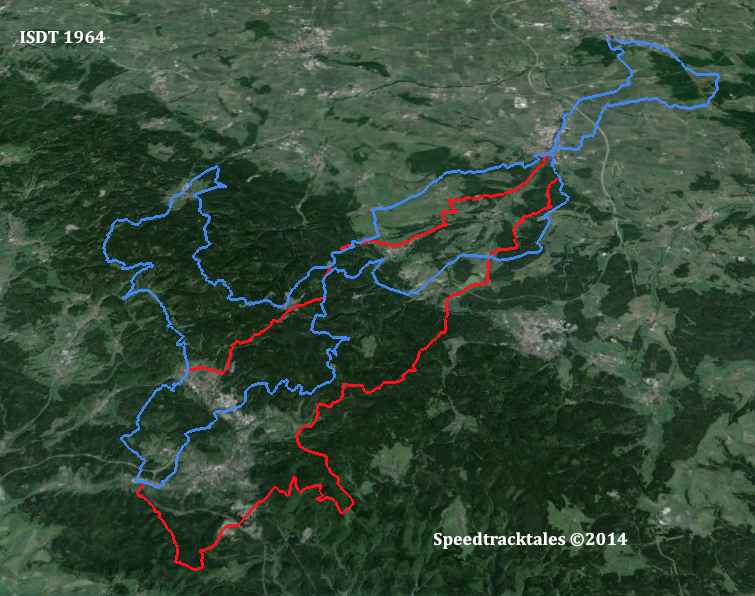 Hilly Thurlinger Wald was the region’s general term & the Summer had seen less rain than is normal in Europe. 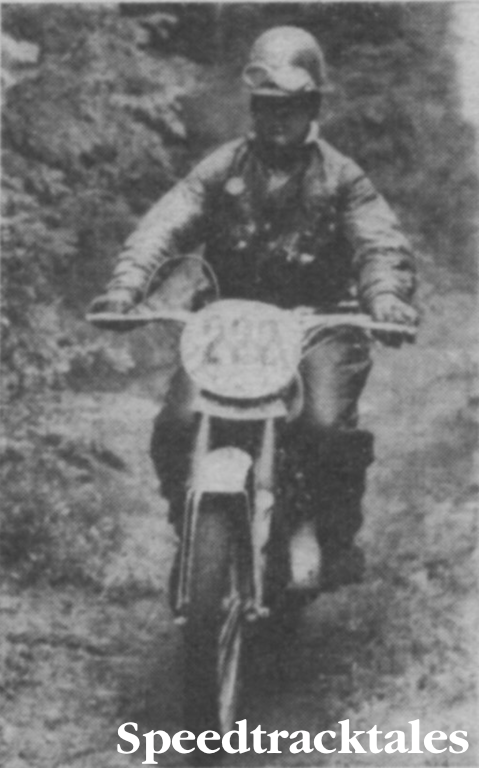 Johnny Giles was keeping in front in the 750 Class over Ken Heanes on the big 650 Triumphs, followed by USA men Cliff Coleman & actor Steve Mcqueen. 500 Class was being dominated by Moto Cross man East German Fred Williamowski 352 MZ, Sammy Miller 500 Aril & Dave Nicoll 500 AJS followed him & became second & 3rd in class after the Saturday speed test. We shall eventually have far more daily progress stories added to this 1964 page. 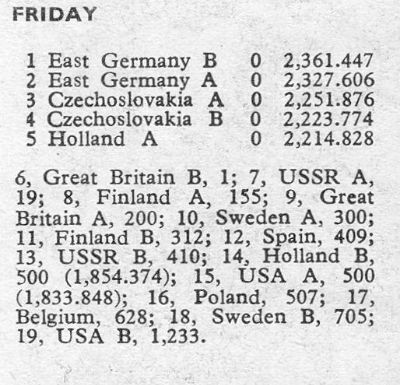 ‘Bravo Britain’ hailed press writers, however for the second year East Germany had beaten Britain’s best. 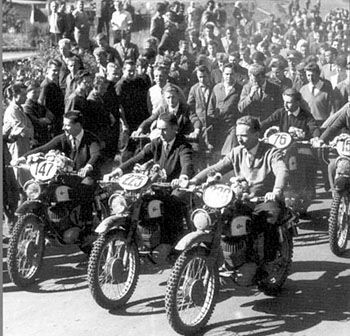 Special Test riders from the Eastern Bloc had excelled & their machinery suited their well trained & qualified riders. Silver Vase for the East Germans with their other 4 man team clinching runner up spot. Britain Vase teams even less lucky than that 6 man Trophy Team. 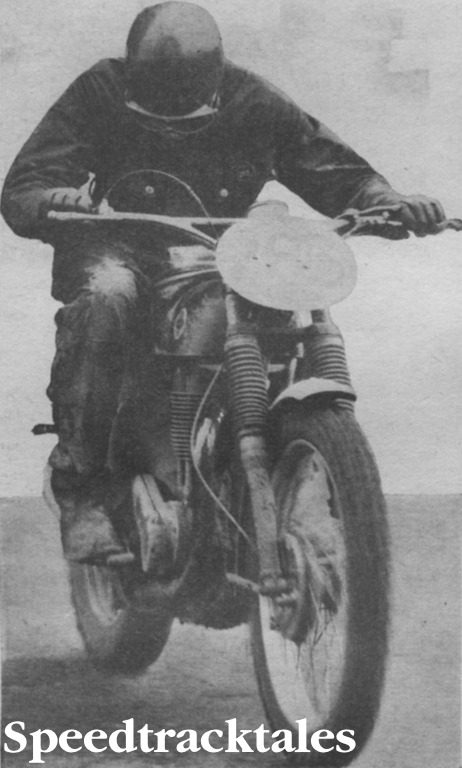 Arthur Bates as a late B team inclusion on his 500 AJS had immediate rear suspension problems on first (Monday) day causing a one mark penalty from outset, he lost only this for the entire event. 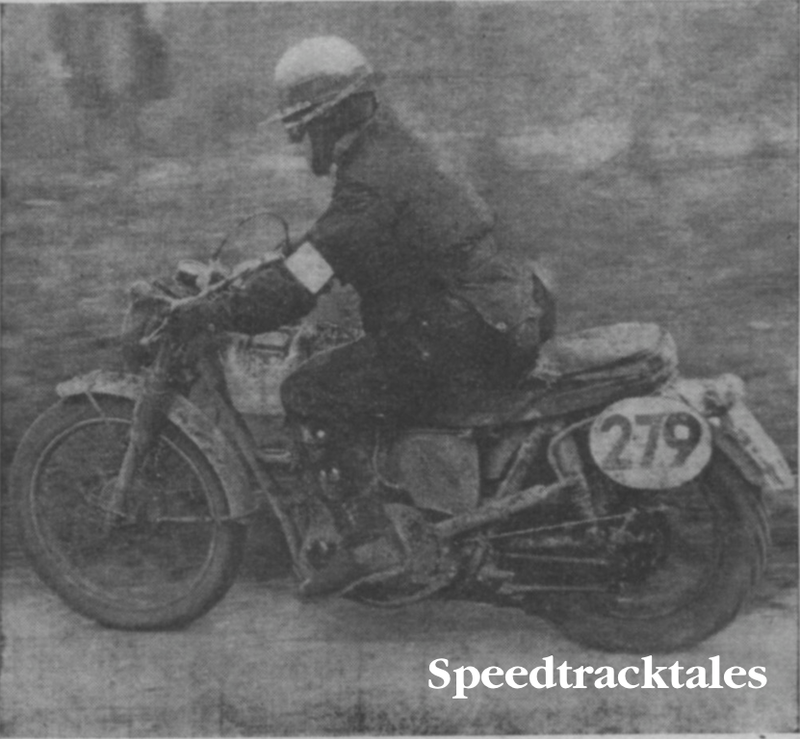 VASE A team had a no penalty score until Thursday when BSA mainshaft of Scott Ellis’s BSA snapped & a 100 marks penatly was incurred.. sad to say it but the machinery seemed less quality than the teamsters. 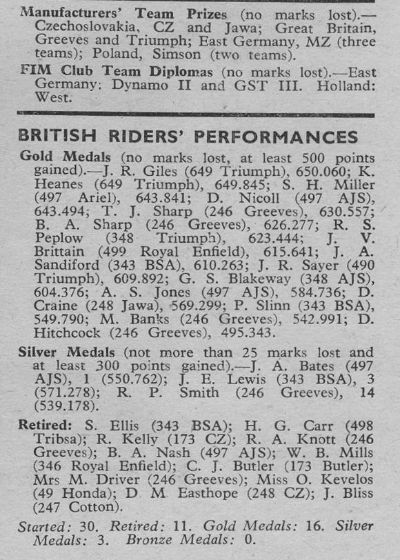 He was the top British rider of the week and placed 8th overall with 650,060 bonus Points. 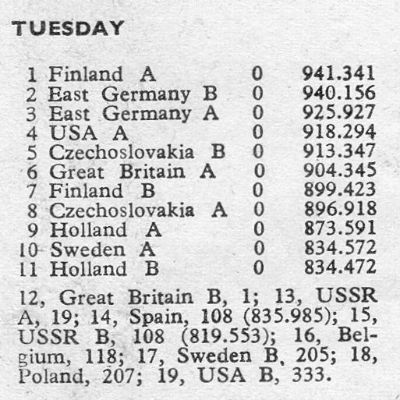 Trophy as always seemed the main aim for all, 5 teams remained ‘clean’ after the first day & special test by Tuesday close Showed East Germany leading Czechoslovakia with Britain’s ‘A’ team 3rd. 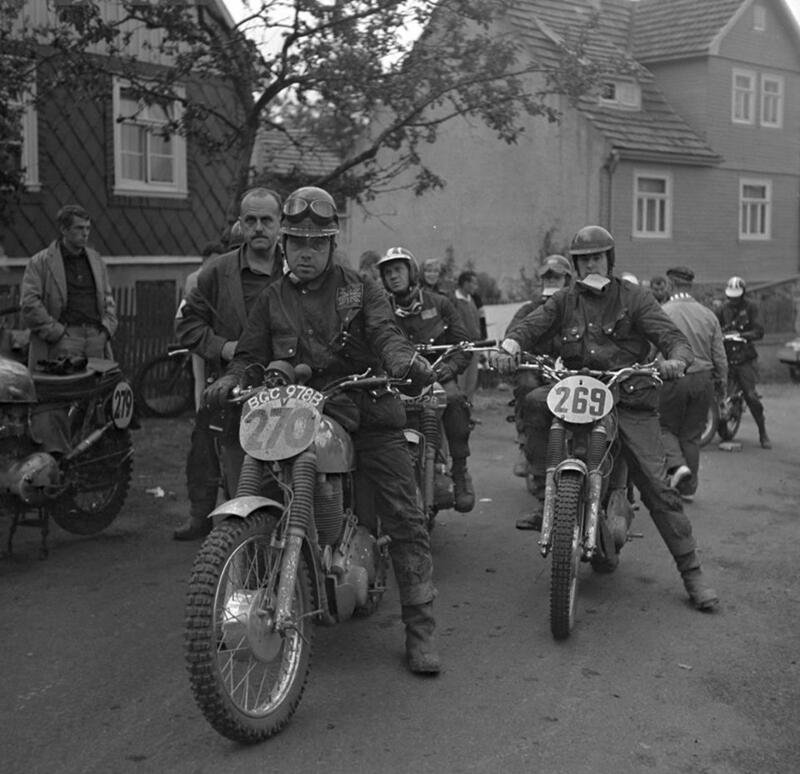 Calamities mounted!, for Austria a retirement plus 3 entrants of theirs having penalties, Polish rider E. Kurowski on a 348 Junak had trouble with penalties incurred. 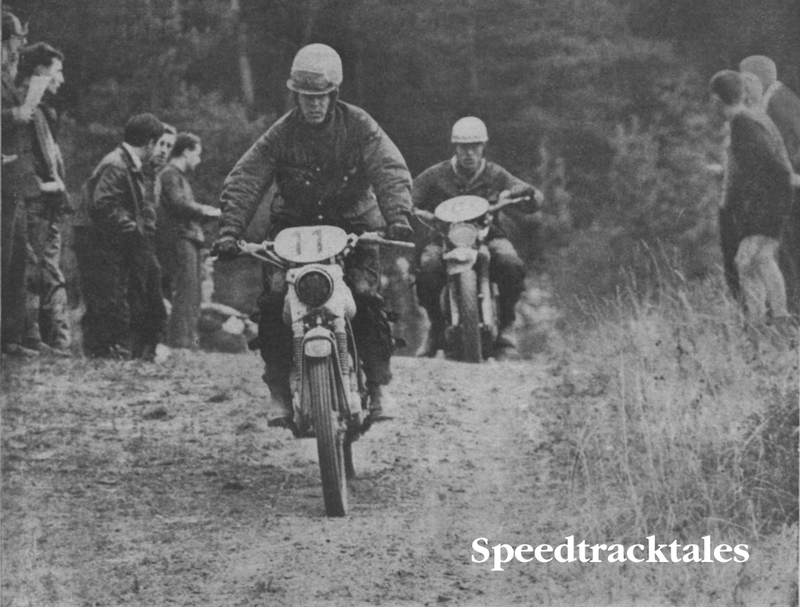 East Germany’s lead increase Sweden’s Bo Sjosvard could not get his Husqvarna running after finishing bravely on Monday with a broken ankle!! !, another Swede B. Ekeberg 174 Husqvarna lost time & Sweden dropped to 6th Place! overall. The Vase 250 class was ruled convincingly by MZ trio of Werner Salevsky, Hans Weber, & Karl Heinz Wagner, after the Monday lead of Czechs Arnost Zemen, Draboslav Miarks on CZ 250s had placed 2nd & 4th. 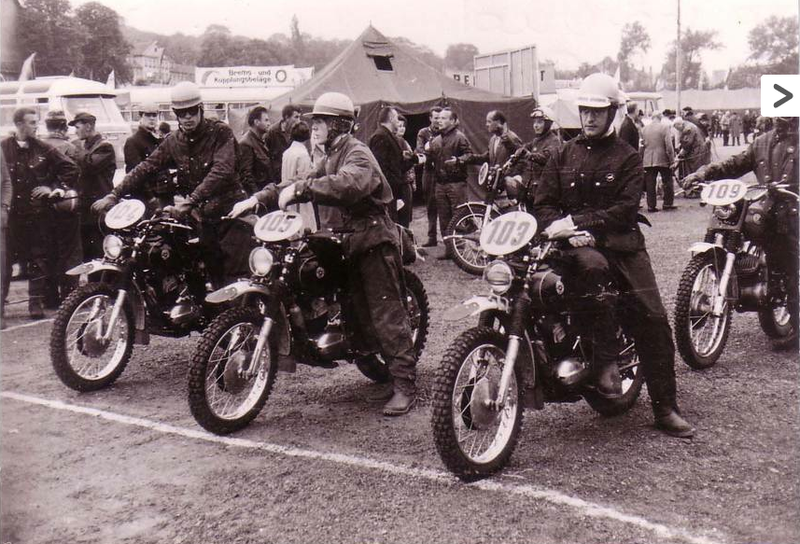 It soon became obvious that Eastern Teams on smaller JAWA & MZs were outperforming all the larger British Classes using Machiner in the case of Class winner EG Trophy Man Bernd Uhlmann on a 292 MZ!. British in the 2 Vase ‘A’ teams were well ‘seen off’ on British ISDT bikes , Triss & Bryan Sharp on Greeves Challengers gave a heckuva show of grit against their competing machinery, both getting into the top 6 in their Class against faster performing machinery. On that surviving machine you can see many times elsewhere in this web. Highly fancied Czechs had struck trouble by Wednesday eveningTrophy man Petr Valek was lost with g/box problems near SUHL Draboslav Miarka 250 CZ had the same trouble, both using new 5 speed boxes. 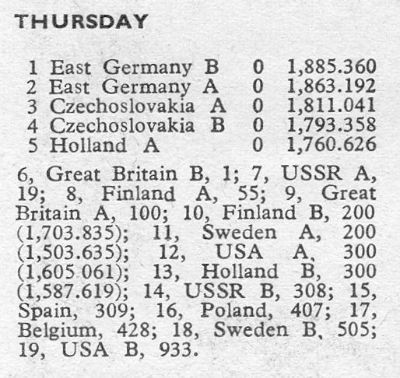 East Germany now led Britain in that Trophy tussle by 2,132,659 to 2,063,363 Bonus Points. 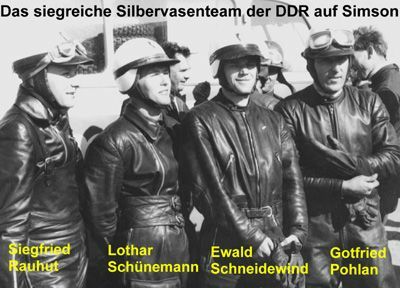 By the end of the day USSR teams had Edwin Kisis 360 ISCH retired, East Germany extended their lead. 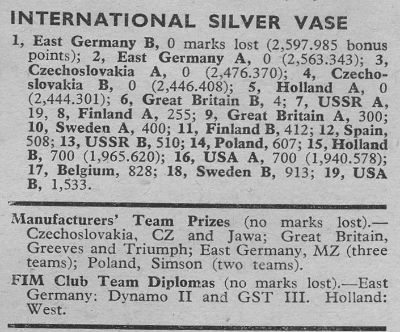 in the Vase Finland’s Penti Karha had his Jawa 350 frame part and even got it welded to continue but with 55 points going against him but they were to improve into second spot by a single bnus point, Karha was later, by Friday morn excluded for ‘Outside Assistance & East Gernay B led with their A team second. 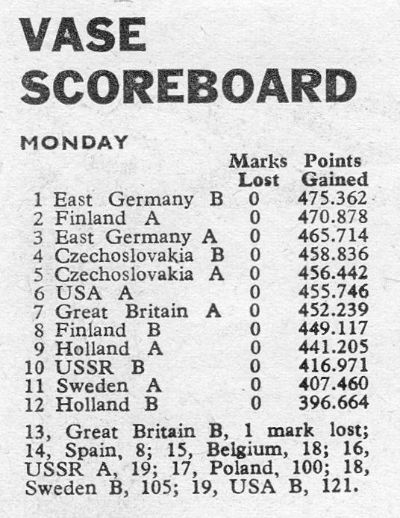 A slight increase in East Germany’s lead, just 8 bonus points by the close, 113 ahead was to prove too much for reversing in Saturday’s Speed test. 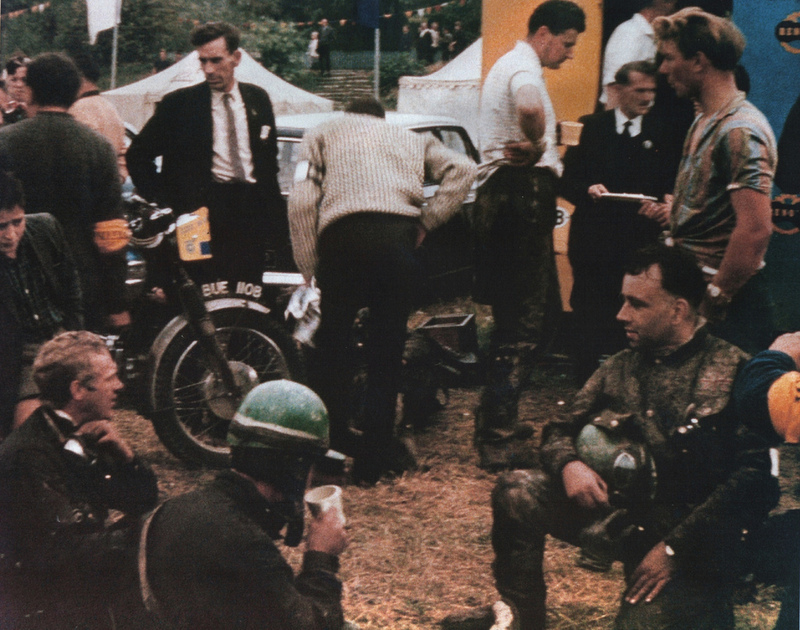 Saturday’ doom gremlins pounced upon John Lewis British Vase B rider’s BSA 343, ignition trouble at the start then 20 points for failing to cross the finish line robbed him of a Gold & probably gave Japanese manufacturers a market they could dominate ever after. 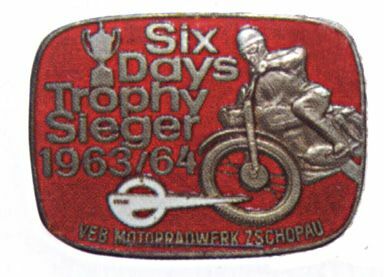 Best Individuals performances were those of Siegfried Rahut on the tiny Simson 49cc, Pter Uhlig 173 MZ, Werner salevsky 242 MZ, Bernd Uhlmann 292 MZ, G. Pohlan 73cc Simson, F. Williamowski 352 MZ, all of East Germany, seventh,Polish veteran rider Zdenek Polanka on a 175 CZ. 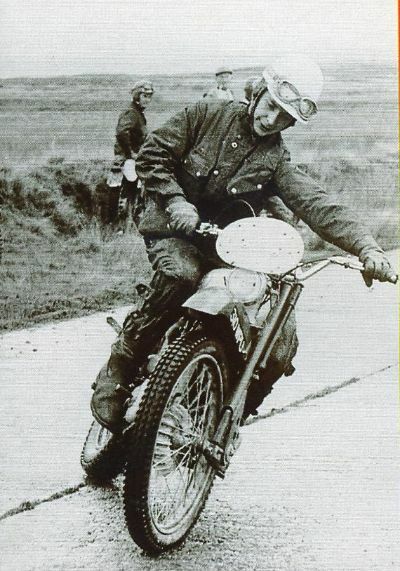 USA with 10 riders had a not too lucky ISDT, Bud Ekins on the 500 Triumph whilst Steve McQueen parted company several times with his 650 Triumph. 226 Starters 62 Retirements, 164 finishers, 121 received Gold Medals, 31 Silver & 12 Bronze. 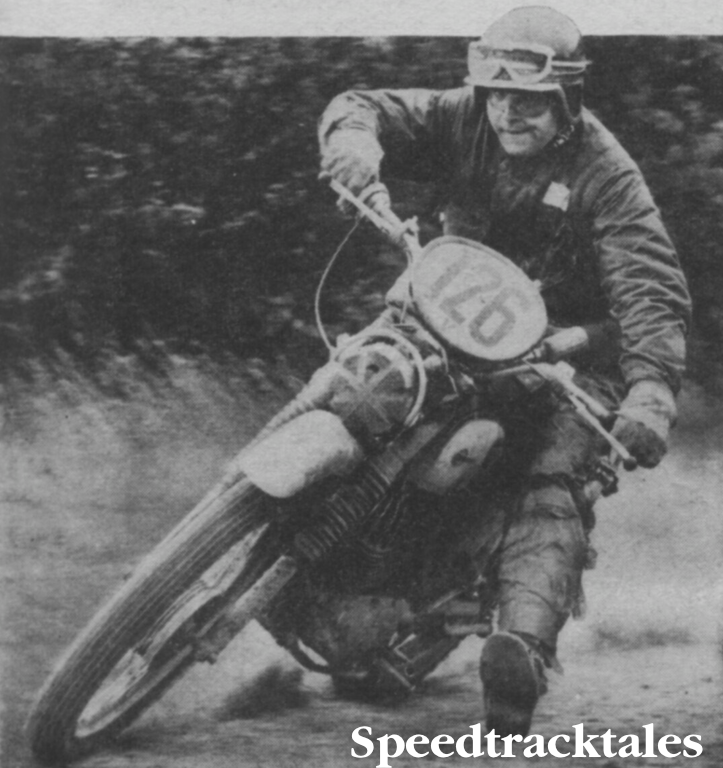 Speedtracktales is grateful to Morton’s Archive for their support. Fantastic pictures and stories, thanks. If you could let me have your Postal address I will send the full resume of those years for you to peruse and enjoy Best Wishes. Maurice Arden, ex-Big John Products. 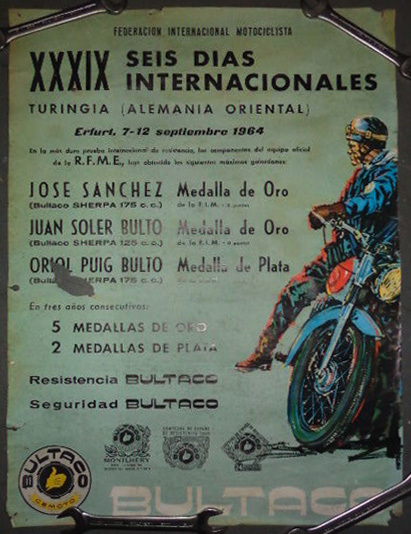 1960 to 78.